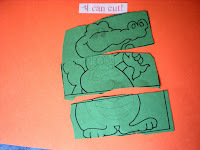 Preschool Playbook: I Can Cut! 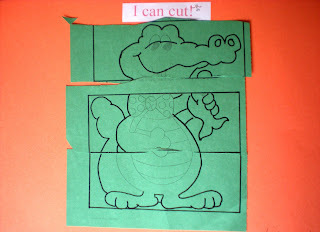 The next page for our "Me Book" is the I Can Cut page. I give the children a picture of Ally the Alligator that is all mixed up. The children have to cut Ally apart and put him back together the correct way. Their cutting skills have come such a long way, I am so impressed at how well they are all doing. 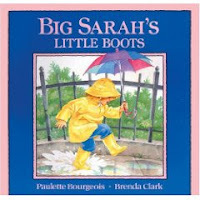 We finished up our day by doing some rhythm stick dancing and reading one of my favorite books, "Big Sarah's Little Boots," by Paulette Bourgeois, illustrated by Brenda Clark. This is such a cute story about a little girl that LOVES her boots and become extremely upset when they "shrink." Will she ever get over the fact that she needs new boots? What a cute, simple idea. When I was teaching it seemed like the boys in my class really need the extra practice in cutting-actually in all fine motor skill activities. This is a great activity for those little fingers. Hello, lots of useful information here. I will be back soon to check it all out in greater detail!